NUMEROUS tiny pores dotting leaves are the main link between plants and the atmosphere. 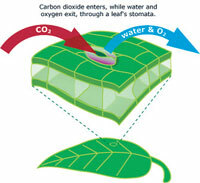 Called stomata, or mouth in Greek, they allow carbon dioxide in for photosynthesis and let oxygen out. They also allow water vapour to transpire. These are not random processes, but well-regulated, sophisticated mechanisms. A pair of lip-shaped cells guarding stomata regulate the quantity of air and water vapour exchanged with the atmosphere depending on the environmental conditions, such as water potential, carbon dioxide level, humidity and light. For example, the guard cells close the pore if there is a shortage of water in the plant. Ecologists from Carnegie Institution of Washington in USA and Institute of Chemistry and Dynamics of the Geosphere in Germany have identified another factor that regulates stomatal movement: the quality of light. The team controlled transpiration from a sunflower leaf by manipulating the quality of light falling on it. They directed light from a halogen lamp by a front surface mirror, which reflects all spectra of light, to fall on the leaf. Then they reflected light through a cold mirror, which allowed all spectra but infrared radiation. Transpiration caused by the full spectrum was 1.09 times the transpiration caused by the cold mirror radiation. This is because the leaf absorbed 18 per cent more energy from the full spectrum than that from the cold mirror, the scientists reported in the Proceedings of the National Academy of Sciences on July 27. The scientists repeated the experiment on cocklebur, maize, barley, bean and oleander leaves and observed transpiration varied depending on the energy content of the radiation. "Our work shows transpiration, and hence stomata, respond to the energy content of light, indicating that the stomatal movement does not happen only through a photoreceptor," said Joseph A Berry at Carnegie Institution of Washington. Berry led the study. Since stomata influences the rate at which plants absorb CO2 and release water vapour—both greenhouse gases—the scientists say the finding can help prepare improved weather and climate models.